Security Fence Company PVC Porch Railings and Stair Railing Systems never need painting. They are maintenance free, available in various styles and guaranteed for life. SFC PVC Porch Railings and Stair Railing System Install Quickly. All sections are made to order with uprights evenly spaced. 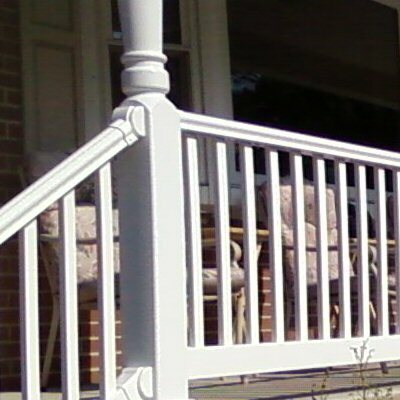 Porch rails can be installed between existing posts or choose one of our full height posts. Full height posts can be decorated or load bearing, and they are available in Veranda, Gothic, Victorian, or smooth styles.